Argyll Road, Longton. Photographed by William Blake. Belgrave Road, Dresden. Photographed by William Blake. 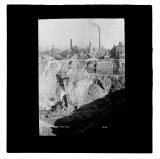 Coal Strike, March 1912. Coal Pickers at Florence Colliery, Longton, Stoke-On-Trent. Photographed by William Blake. Congleton Edge, From Cloud End. Photographed by William Blake. Landscape with a view of Congleton Edge taken from Cloud End, Cheshire. Demolition of a Pot Bank, Longton. Photographed by William Blake. Industrial landscape showing the demolition of a pot bank. Taken at Longton, Stoke-on-Trent, Staffordshire. Destruction of an old Colliery Stack on Sandford Hill. May 1st 1913. Photographed by William Blake. Chimney demolition taken at Sandford Hill on May 1st 1913. The felling of Dimmock's chimney, June 15th 1905. The Dimmock's building stood between Stafford Street and Cheapside in Hanley centre. This is the site of the old skating rink.